I apologize to those of you who are regular readers. This has been a very different week! As any of you know who read my blog regularly, I am in Florida for the winter. I have a small mobile home -- one bedroom, one bath, open living room and kitchen, a screened in porch or lanai, and an outer Florida room which can serve as a guest bedroom as I have a futon and an air mattress. This is an older mobile home and has been added to and changed a lot over it's nearly 50+ year existence. And just like when you start any updating of any 50+ year old home you never know what you are going to run into. Within a day or so of my arrival I realized the two slider windows in the living room area needed to be replaced because of dry rot. Fortunately, there were no termites, as that can be a problem in Florida. I have a awesome handy man who is almost 82 years old. I have yet to ask about a job that he doesn't say, "Yes, I can do that." Or he will say, "Yes, I could do that, but you will have a better job done if you don't hire me and use a skilled professional in this area." Then the base of the toilet cracked. I wasn't expecting that! That was replaced on the day it cracked! I knew there was some painting that had to be done. I did some of the painting, and I hired someone to do most of the exterior painting work. While the hurricane awnings were down to install the new windows I managed to get those painted. And I have washed off the dirt and mold from the siding. I knew I wanted to do something with the kitchen cupboards to update them. 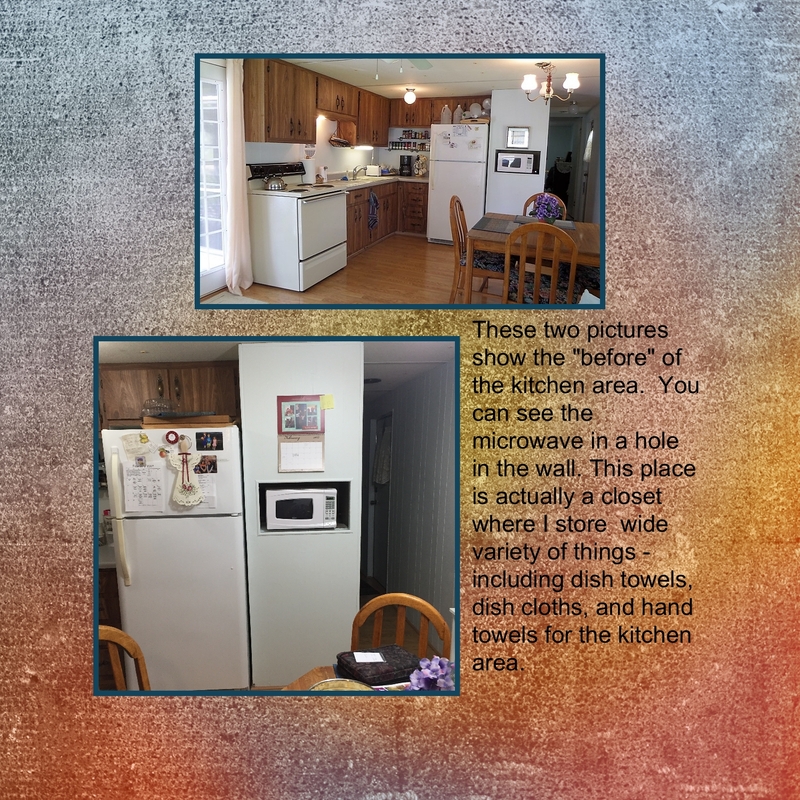 As I thought about what to do, and how to do it, and what the property value changes would be -- I finally decided to just replace the existing cupboards with new and redesign the arrangement of the cupboards, move the exhaust fan, put the microwave and exhaust fan AND light over the stove like any normal kitchen. I will have a spice cupboard and a cookie sheet cupboard. I will have more usable storage areas, it will just be better. After I made the purchase, I then began to get cold feet. It was more money than I really had planned to spend. I couldn't help asking myself if I was I making a mistake spending this amount of money for a place I only spend 3-4 months in a year? Then I learned a neighbor could use the kitchen cupboards. I told him they were free for taking the cupboards out. 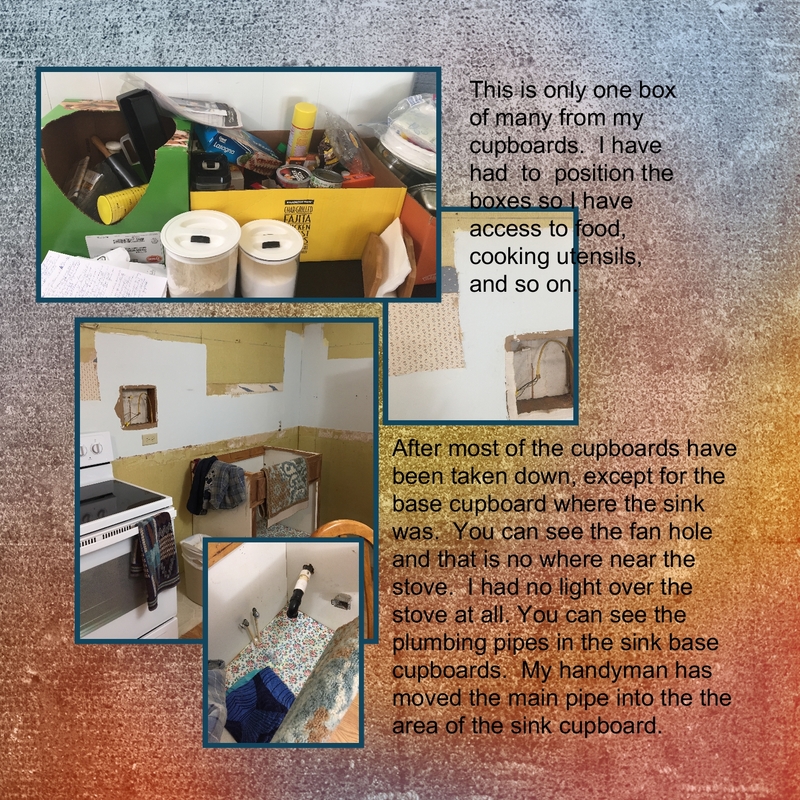 The work involved in taking out the cupboards would have cost me $200-300 by my handy man so that saved me money. My handy man had to take out the base cupboard for the sink because of the plumbing involved. Then oh dear, the sub floor under the sink and out into the main are sub flooring show water damage over the years as there were water ring stains. And the sub floor under the sink was not just stained, it was totally gone and a bowl appearance was there. The sub floor was wet and swollen and in pieces. Had I not made the decision to replace the cupboards this might not have been discovered for another year or more. In the mean time, the water damage would have spread and according the experts in all of this, I would have had a huge and very costly mess on my hands. 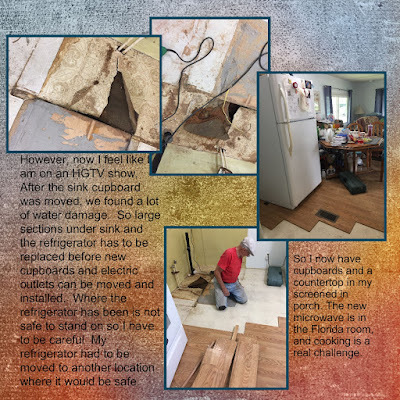 The water damage would have spread and I would likely have had to replace the sub flooring in the whole home (at least in the kitchen, eating are, and living room), including some of the wooden supports. And I wouldn't have had new cupboards either. So here I am in the middle of a mess, washing dishes in the bathroom sink (I fix and eat breakfast and a simple lunch but not the main meal of the day) which is very inconvenient. In the midst of this mess I will create cards for the Technique Junkie March Release Blog Hop on March 1. I hope you can join us. I received a crafting package from Marco's today and perhaps I can use some new stuff. See you on Wednesday morning for the Blog Hop! I created the color behind the Technique Junkie Talking to You background stamp - http://techniquejunkies.com/talking-to-you/ - with the Technique Junkie Antique Glimmers technique. It is one of my favortite techniques because it is EASY and the results are just interesting to see. I stamped the stamp with Versafine black and heat embossed it with clear embossing powder. The kitty is Technique Junkie Cat Squared 2- http://techniquejunkies.com/cat-square-2/. She is stamped with black Memento ink and colored with Copic markers. 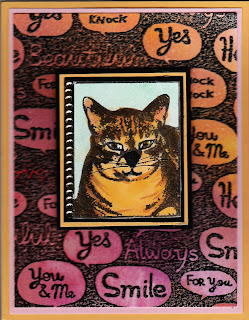 Layers to bring out the colors in the kitty and the background panel and a row of beads finish the card. Hope your day is going great! And that you are getting inky. 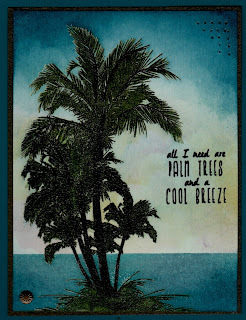 I used the same technqiue for this card as I used for the Palm Tree card on February 8 - http://judysstampart.blogspot.com/2017/02/a-cool-breeze.html. Both of these stamps are Technique Junkie stamps. The rose stamp is Stylized Roses - http://techniquejunkies.com/stylized-roses/ . I used the verse from Something Will Grow - http://techniquejunkies.com/something-will-grow/ . I used layering of colored card stock, background paper, dye-based markers, Versamark ink, clear embossing powder, torn vellum, Memento ink, and rust rhinestones for ebellishments. I think everyone knows some folks who just know how to have a good time. They can find fun almost anywhere. They can create fun out of the most unusual things. I have some sister-in-laws like that. These two ladies are just like that! This is a Technique Junkie stamp that is called By Us - http://techniquejunkies.com/by-us/. I colored the ladies with my Copic markers, and I added tiny pearls to the first ladies hat. This focal image is layered on card stock embossed with an embossing folder. I used a very stiff sponge to add some color to the embossed petal or hearts. I added a gold ribbon. We all need to send birthday cards from time to time. But a lot of us have difficulty making masculine birthday cards that have flowers. I hope I accomplished that with this card. The color scheme is certainly masculine. The map would be considered masculine. The flowers are a simple, straight line and in masculine colors. The flowers are Technique Junkie Daisy Garden - http://techniquejunkies.com/daisy-garden/, and the greeting is Technique Junkie Happy Birthday - http://techniquejunkies.com/happy-birthday/. I created the flowers using the same technique as shown by Jill Foster here - https://www.youtube.com/watch?v=ocRj8t9p-7A&t=1s . That gives a deeper dimension to the flowers than just straight stamping. The paper must have shifted in the MISTI -- http://techniquejunkies.com/misti-most-incredible-stamping-tool-invented/ - because I got two lines for the stem. And in the middle of creating this card, my trusty heat tool here in Florida died! But I have had it for over 20 years so I cannot complain. I had planned to emboss the greeting to help it stand out against the map. 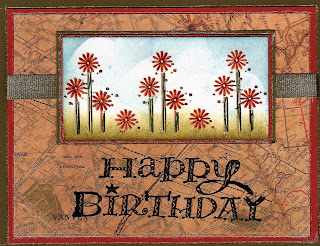 So once again I used the MISTI, and just stamped, reinked, stamped, reinked, stamped, and so on until the greeting until it was dark enough to stand out against the map background. The grass and clouds are sponged on. Layers and a dark green ribbon stripe finish the card. 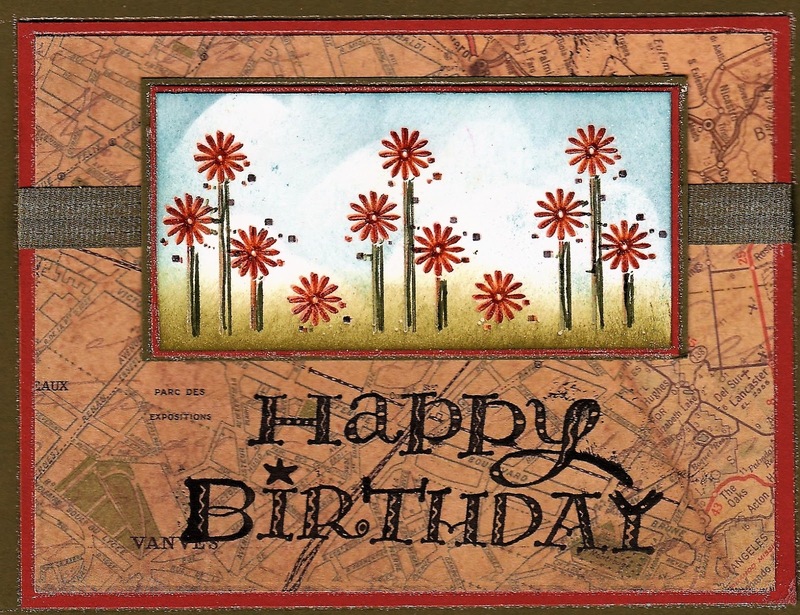 No bow, no bling, darker colors, and a map background create this masculine card with flowers. The first thing you need to know is today is the last day for the 15% off of the Technique Junkie February release stamps - http://techniquejunkies.com/february-2017-release/. So if you haven't gone shopping, you need to do that today! I really, really like this Technique Junkie Palm Tree stamp - http://techniquejunkies.com/palm-trees-set-of-3/ . But I was disappointed with how I was able to use it. However, the problem was with the stamper (me!) and not the stamp! 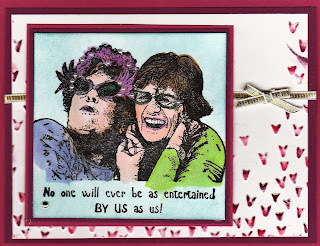 I loved how Kathy used it on her blog for the February Blog Hop on February 1. In case you do not know what I am talking about -- here is the link: https://craftynurse4u.wordpress.com/2017/02/01/technique-junkies-february-blog-hop/ . She used this stamp for her first card. But the real magic come from using the MISTI http://techniquejunkies.com/misti-most-incredible-stamping-tool-invented/ AND Pat sells it! Jill Foster shows this technique that both Kathy and I used with this wonderful stamp. https://www.youtube.com/watch?v=ocRj8t9p-7A&t=1s . Again I am somewhat limited because I am in Florida and have a limited amount of supplies with me! But markers, sponging, a home made cloud stencil, painter's tape, and black Versafine ink with clear embossing powder made it good! This is one of the fun new Technique Junkie February Releases. 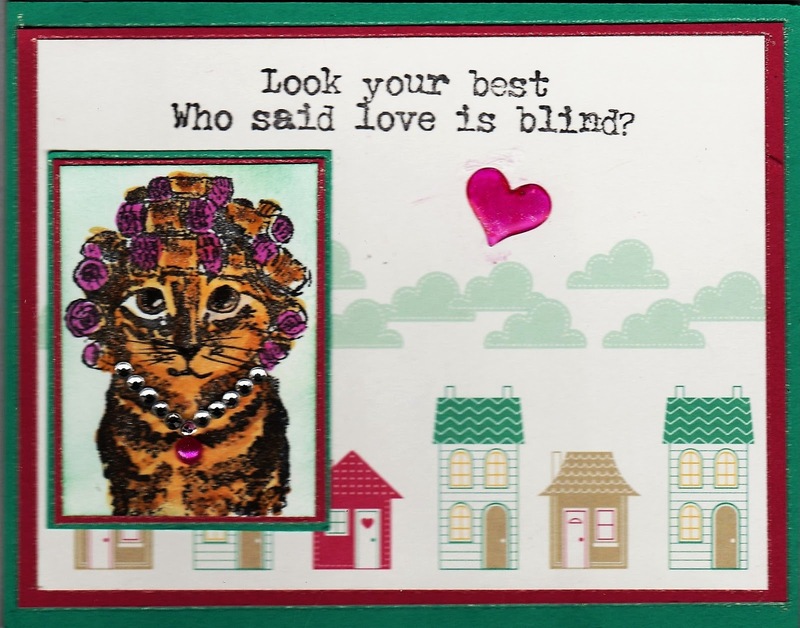 I love this kitty in the new Kitty in Curlers stamp - http://techniquejunkies.com/kitty-in-curlers/. However for this card it is the verse from Technique Junkie stamps - Mae West Sentiments - http://techniquejunkies.com/mae-west-sentiments/ - that makes the card. Miss Kitty is colored with Copic markers. Then I added rhinestones and a pearl to create a necklace for her big date. A clear heart and the pearl are colored with a hot pink Copic marker. 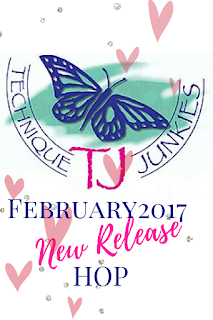 So now I hope you do know that the February Releases for Technique Junkie are on sale for 15% off through February 8. What are you waiting for? I decided to pull out an old favorite technique for this card (and for several others I made tonight and will post later on this month) -- Antique Glimmers. I have all of the supplies for that technique here in Florida! 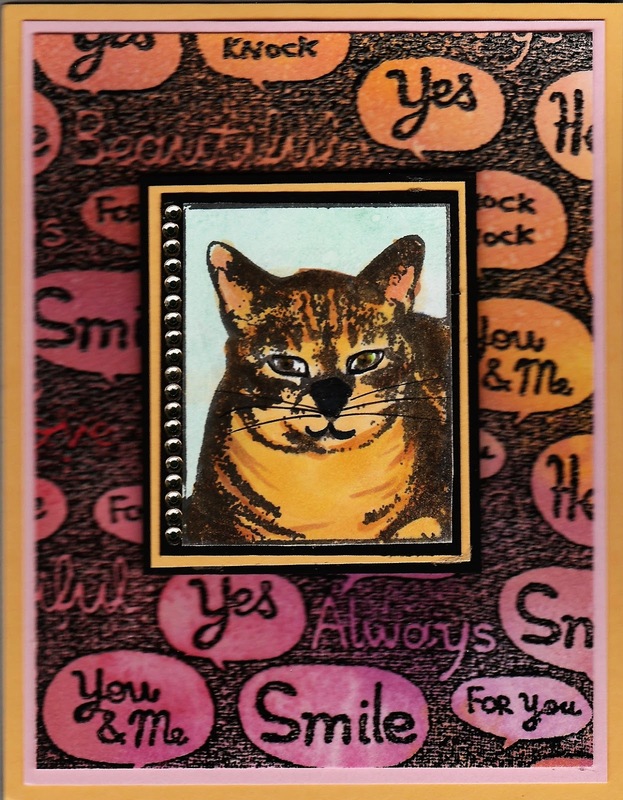 I used a variety of colors of Distress Inks for this card. Then I used a new Technique Junkie February release stamp CAlligraphy Loops - http://techniquejunkies.com/calligraphy-loops/ and a fun Technique Junkie stamp called Stand Tall - http://techniquejunkies.com/stand-tall/. I used black Versafine ink with clear embossing powder on the calligraphy loops and heat embossed it. Both the background card stock and the focal image card stock used the Antique Glimmers technique. Several layers of card stock and a row of black self adhesive pearls finish the card. I also want to say that having a great background stamp is wonderful in my stamp collection. You do not need to have a certain theme of stamp to go with it. Almost any stamp will go with this calligraphy stamp. And it (as well as all of the Technique Junkie February release stamps) is on sale for 15% off through 'February 8! Have you made your choice of stamps to buy yet? Happy February! Happy New Stamps Day! Happy Blog Hop Day! The first of each month is always exciting to me. It is the day the Technique Junkie Design Team gets to show you the creations we have made with the new stamps from the latest reveal of Technique Junkie stamps. So all of the cards I am sharing with you today are from the Technique Junkie line of stamps. I am spending the winter in Florida. The vast majority of all my stamping supplies are still in Pennsylvania. My first card uses SD693 Throw Kindness - www.techniquejunkies.com/throw-kindness/. I used Memento black ink and then Copic markers to color in the confetti. Layering and a ribbon finish the card. I love this SS069 Palm Trees Set - www.techniquejunkies.com/palm-trees-set-of-3/. To color the trees I inked the entire stamp with green ink, and then used a brown marker to to color the trunks of the trees. Two shades of blue card stock for layering, a ribbon, and a bow. I used a hand drawn template for the clouds and sponged the sky and water around the base of the trees. The verse is also in the set. For this card I used a pale blue ink for the background stamp S707 - Talking to You - www.techniquejunkies.com/talking-to-you/. Then I used another Technique Junkie stamp - Hat Ladies - http://techniquejunkies.com/hat-ladies/ . Layers of paper and card stock and Copic markers for coloring the ladies, sequins and beads, ribbon, and a glitter pen add to the card for interest. I love these ladies as they can be used in so many ways. It uses S714 Calligraphy Loops - www.techniquejunkies.com/calligraphy-loops/, and SD737 - End of Your Rope - www.techniquejunkies.com/end-of-your-rope/. I used a dark brown ink for both stamps. I used the edge of the stamp on the card stock edge with the verse. Then I used some burlap ribbon, and pulled off a few strands to make a knot to tie around the verse layer. The loops on the background stamp reminded me of rope knots. So my card were fairly simple this month. Thank you for reading my post, Please hop along thee rest of the hop to see all of the eye candy the Design Team has for you! 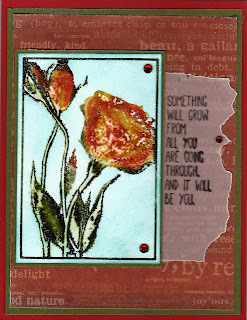 Your last stop will be with Pat Huntoon - http://patstamps.blogspot.com. I hope you have enjoyed this blog hop. I am wondering what your favorite new February release is. 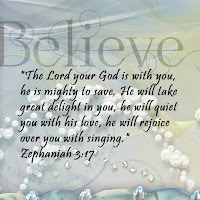 Pat Huntoon: http://patstamps.blogspot.com - Go here next! 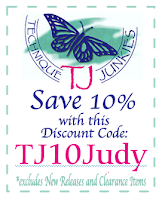 Don't forget the 15% off sale on the Technique Junkie February release stamps! Have a great day and get inky!